Running with SD Mom: Will Run for the Hills...er...Chocolate! What do you get when you cross a gimpy hip and a gimpy knee and add in a couple awesome matching outfits? 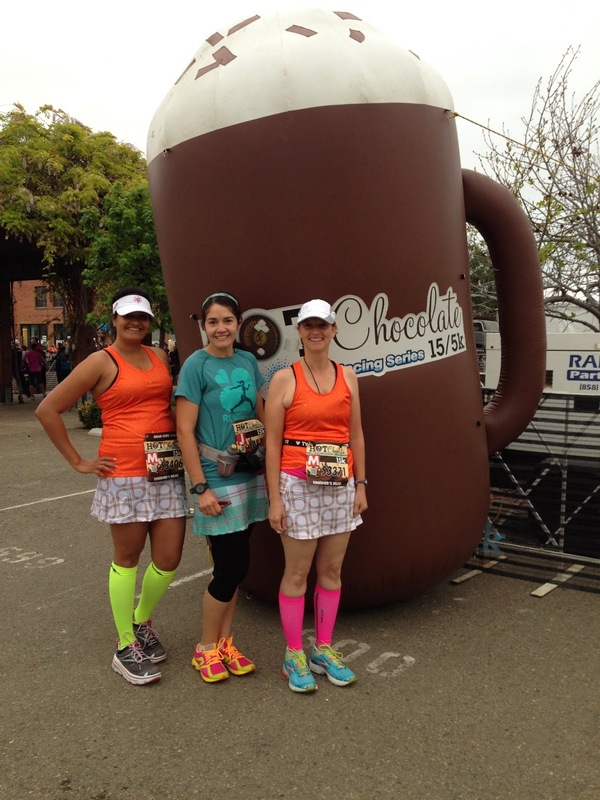 The Hot Chocolate SD 15k! 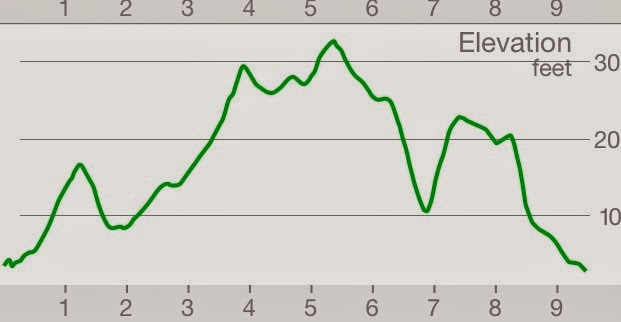 Oh and hideous horrific hills! I had a busy workout last part of the week. 5 miles on Thursday, Jazzercise on Friday and the Autism 5k on Saturday. I knew going in that I would have tired legs. So I loaded up on my Nuun on Saturday to feed the electrolytes back into my body, especially my legs. Did it work? Would these tired legs make it up those mountains...um...hills? I woke up with my usual routine. Fish oil pill (Costco), 16 oz of water and a Luna Bar in White Chocolate peppermint, slowly consumend on the way to the race with my friend Shasta. Then between pictures and no more than 20 minutes before start time, I take my Vega Pre-Workout Energizer in the acai berry flavor. (Warning: product contains caffeine!). Met up with my amazing friend Kat (a BQ runner!) and many other lovely running friends. Aren't runners the nicest people ever?! Don't you love the matching outfits? 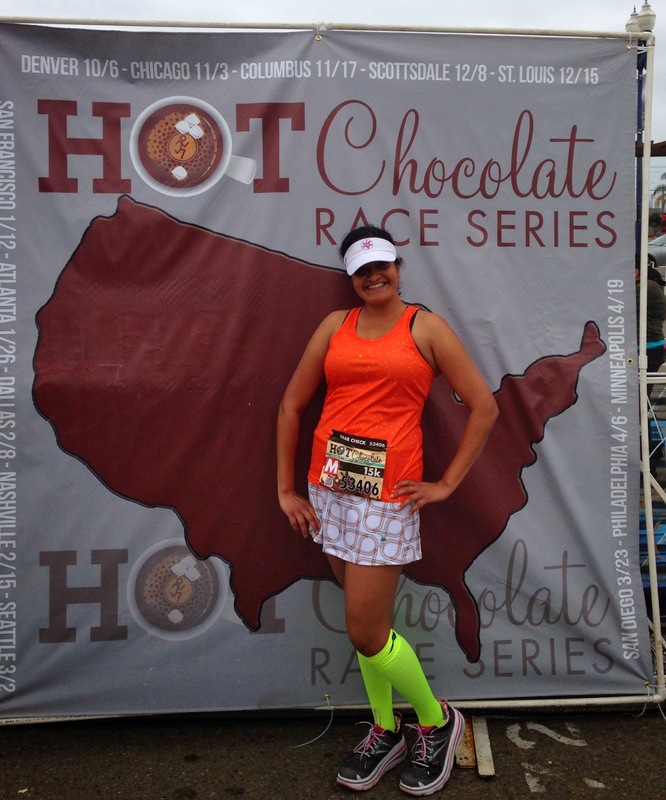 The tanks are from Run Pretty Far and the skirts are from Running Skirts, socks are from Pro Compression. And the shoes?! Oh the Shoes! Best shoes ever...did I say that already? Best Shoes Ever! So thanks to my friends, my gear and the promise of delicious chocolate fondue at the end, I made it, gimpy hip and all. Special shout out and thanks to J. Mo for getting us thru Miles 5.5-7.5. Maybe next year, I’ll do the 10!